Our regional publication brings readers the very best of what Rhode Island has to offer — from people to politics, food to finance. Every month, our unique, award-winning publication builds upon a powerful relationship with almost 200,000 affluent, educated and involved readers. We boast a subscriber renewal rate of 80%. 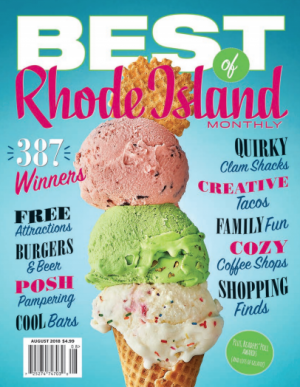 Rhode Island Monthly Communications, Inc. also publishes several annual titles serving niche markets, including Rhode Island Monthly’s Engaged serving the bridal market and our annual hotel publication with companion mobile app – An Insider’s Guide to Rhode Island reaching 1.5 million visitors to the area. Our annual Home Design book reaches affluent homeowners and connects them with architects, designers and other suppliers for unique high end shelter projects. We also publish the Official Travel Guide for the State of Rhode Island and many other contract publications. Our publications are in print and available digitally. We also created several successful e-newsletters with frequencies from quarterly to monthly to weekly.